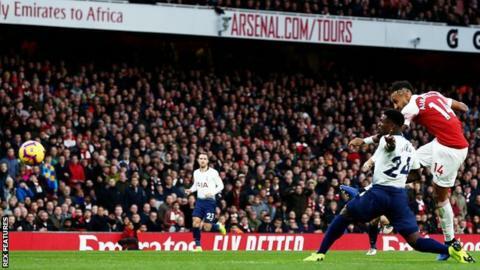 Arsenal face another game against fierce rivals when they visit Manchester United at 20:00 GMT, while Tottenham host struggling Southampton at Wembley at the same time. Match ends, Arsenal 4, Tottenham Hotspur 2. Second Half ends, Arsenal 4, Tottenham Hotspur 2. Corner, Arsenal. Conceded by Juan Foyth. Attempt blocked. Christian Eriksen (Tottenham Hotspur) right footed shot from outside the box is blocked. Assisted by Harry Winks. Attempt missed. Lucas Moura (Tottenham Hotspur) header from the centre of the box misses to the right. Assisted by Ben Davies with a cross following a corner. Attempt missed. Sokratis (Arsenal) left footed shot from outside the box is too high following a set piece situation. Attempt blocked. Héctor Bellerín (Arsenal) right footed shot from outside the box is blocked. 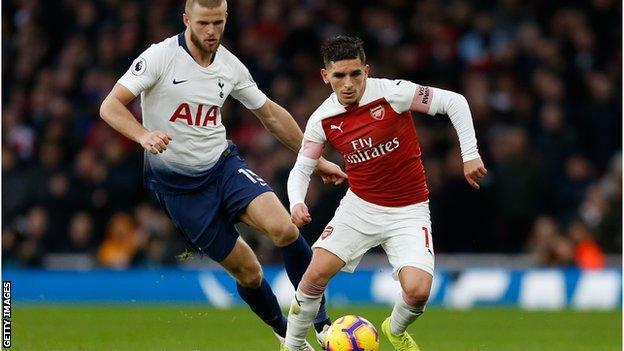 Lucas Torreira (Arsenal) is shown the yellow card for excessive celebration. Goal! Arsenal 4, Tottenham Hotspur 2. Lucas Torreira (Arsenal) right footed shot from a difficult angle on the right to the bottom left corner. Assisted by Pierre-Emerick Aubameyang. Goal! Arsenal 3, Tottenham Hotspur 2. Alexandre Lacazette (Arsenal) left footed shot from outside the box to the bottom left corner. Assisted by Aaron Ramsey. Substitution, Arsenal. Matteo Guendouzi replaces Shkodran Mustafi because of an injury. Attempt saved. Son Heung-Min (Tottenham Hotspur) right footed shot from outside the box is saved in the bottom left corner.